The consensus All-American as a senior in 1966 was chosen by the Lions in the first round of the 1967 NFL/AFL draft (seventh overall). A slashing runner with good hands and blocking ability, it was anticipated that he could play at both halfback and fullback. Lions went 5-7-2 to finish third in the Central Division of the NFL Western Conference while finishing third in the league in rushing yards (1907). A knee injury that required surgery limited Farr to nine games in 1968, yet he still led the club in rushing (597 yards) and touchdowns (7, tied with flanker Billy Gambrell). After appearing in just five games and running for 245 yards in ’69, Farr came back with a Pro Bowl season in 1970 as he rushed for 717 yards, caught 29 passes for 213 more yards, and scored 11 TDs. However, nagging injuries diminished his play in his last three seasons and he dropped behind HB Altie Taylor on the depth chart. He retired in 1973 having rushed for 3072 yards on 739 carries (4.2 avg. ), caught 146 passes for 1374 yards (9.4 avg.) and scored 36 touchdowns. 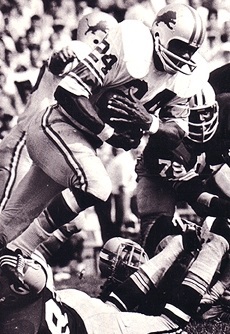 Farr received second-team All-NFL honors once and was twice chosen to the Pro Bowl, but injuries diminished his promising career. His older brother Miller was a defensive back in the AFL and NFL and two sons, Mel Jr. and Mike, went on to play in the NFL.